Adding the right explosive exercises to your workout can make your next run feel lighter and faster than ever. When you think about improving your run times, the obvious come to mind: speedwork, hills, strength-​training. What is often overlooked? Power. Adding the right mix of plyometrics – explosive, energy-honing exercises – to your training can make your usual kays feel like you’ve switched to warp-speed mode. “Plyometrics are great for converting strength into speed and explosive power,” says Adam Rosante, strength and performance coach and founder of the Montauk Barbell Club. The movements help runners cover more ground with each foot strike, reinforce minimal ground contact, and promote full extension with every stride, like when you’re running all-out, he adds. Let’s think about that, because two-tenths of a second isn’t a lot of time. (It probably took you longer to read ‘two-tenths’.) How can you perform an entire exercise that fast? Minimal ground contact, Rosante says. Think of stepping off a box, and the instant your feet hit the ground, immediately exploding back up. The key to doing that well is a small number of good reps. You shouldn’t feel as though you’re totally exhausted after doing plyometric movements – they’re not a conditioning tool, Rosante says. But you’re likely to feel a sense of fatigue the next day, because each rep is harnessing all of your power. Even though they’re not body conditioners, plyo moves can quickly make over your running. In a recent study in the Journal of Sports Medicine and Physical Fitness, 24 men – none of whom regularly performed plyometrics – went through traditional, resistance, or assisted plyo programmes three times a week. After a month, they’d slashed seconds off their sprint and agility times, regardless of which style of training they did. 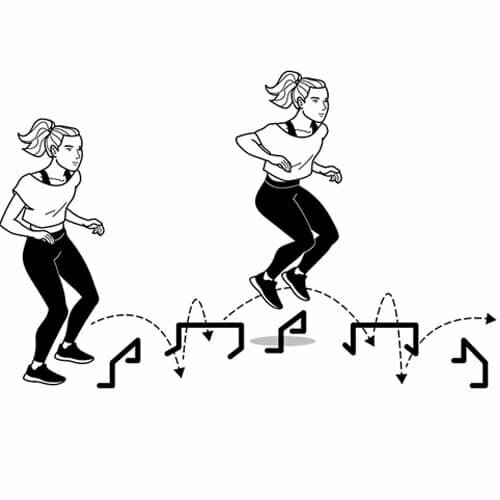 And in a separate review of studies by the Singapore Sports Institute, athletes who did a minimum of one month of twice-​weekly plyometric workouts – regardless of gender or running level – increased their running economy and performance. Of course, that doesn’t mean you should randomly throw plyos into your training. To ensure that your workouts are high-quality (and to reduce your risk of injury), it’s best to do exercises that are the toughest on your central nervous system, like plyometrics, first. That’s why Rosante suggests doing the workout he designed here at the beginning of a strength-training day, before a run, or on its own for a quick power session. Then give yourself a 48- to 72-hour break from plyos – your body needs that much time to fully recover. And you’ve totally earned it. 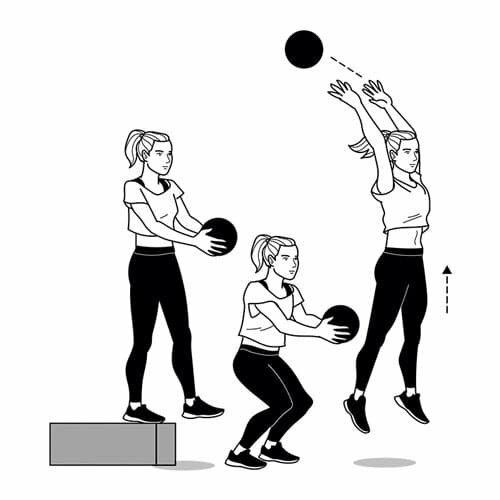 Just say no to these common plyometric mistakes. Before you can leap on a leg, you have to be able to stand on it, Santucci says. Otherwise, there’s a good chance you’ll get hurt. That’s why, before starting any plyometric program, he recommends adding balance moves, such as single-leg deadlifts and lateral lunges (with and without weight), into your workouts. Once those moves are mastered, start adding plyos. Thinking every jumping exercise is plyometric. “Plyometrics may involve jumping, but not all jumps are plyometric,” Rosante says. One common mistake he sees: squat jumps. Lowering into a deep squat and jumping as high as you can means your feet are in contact with the ground for too long; the muscle tension dissipates so you have to generate force to jump. Instead, perform a depth jump (right) to practise building eccentric strength and keeping ground contact light and speedy. More doesn’t always mean better. Going gang-busters on your rep count means you’re probably overtaxing type II muscle fibres – the ones used for fast, explosive moves like sprinting – which will actually make them less effective at firing, Santucci says. Instead, keep your reps in the 6 to 10 range, and focus on fully extending the muscle each time. Sticking with the same four exercises. Being too committed to moves means you’re waiving more muscle-boosting benefits. After four to six weeks, there isn’t much left to gain from doing the same moves, Santucci says. Make sure you’re constantly switching up exercises, reps, and rest periods. Doing so will also stave off boredom. Just because you can do weighted step-ups like it’s no big deal, it doesn’t mean you’re ready for weighted hurdle hops. If you’re new to plyos, start with simple jump training – skips, bounds, and low hurdle jumps – and build from there, Rosante suggests. Perform one jump at a time, focusing on form. “It may sound boring and tedious, but if you want to get the real benefits, you need to train correctly,” he says. Those who are ready for more can progress to jumps in succession, then move on to leaps, med-ball throw variations, and depth jumps. Perform each move – explosively! – for 3 sets of the prescribed reps. Rest for 1 minute between sets, and 2 to 3 minutes between moves. • Stand on a raised platform, such as a box or bench, toes on the edge. Step out and drop straight down. (Do not jump.) When you hit the ground, immediately jump straight up. Land softly. Do 6 to 8 reps.
• Set up four to six 25- to 30-centimetre hurdles in a straight line, one in front of the other. Leave about a metre of space after each. Lower into a quarter-squat and explosively jump over each hurdle, making minimal contact with the ground, and moving as fast as possible. Do 4 to 6 reps. To increase the difficulty, move the hurdles either closer together or further apart. • Stand at the edge of a raised platform, holding a medicine ball with an underhand grip. Step off the platform and drop straight down. As soon as your feet hit the floor, jump up and throw the ball as high and far behind you as possible. Do 6 to 8 reps.
• Set up five hurdles as shown. 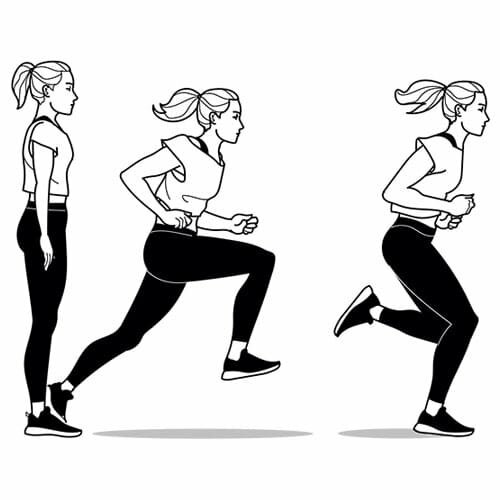 Stand behind the first hurdle, lower into a quarter-​squat, and perform a series of forward and lateral hops over the hurdles as fast as possible, making minimal ground contact. Do 4 to 6 reps.
• Stand tall with both feet together. Bend knees slightly and jump straight up. While in the air, pull your toes towards your shins, emphasising flexion at the ankle joint. You won’t jump very high, due to limited knee involvement. 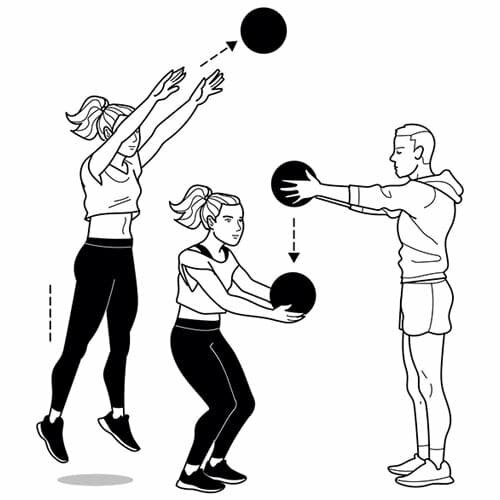 Do 6 to 8 reps.
• Stand with knees bent, prepared to catch a medicine ball. Get a partner to drop the ball directly into your hands from 60cm above. Catch the ball and immediately jump up, throwing the ball as high and far forward as possible. 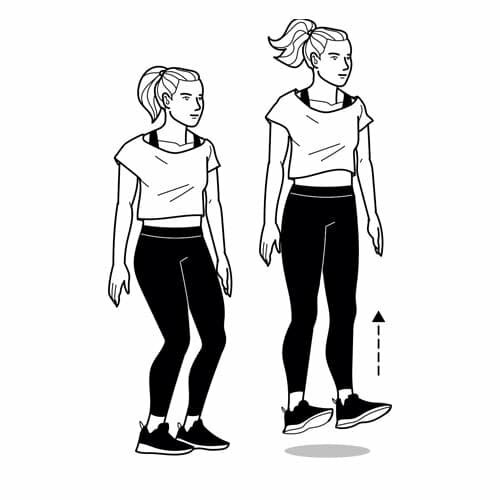 Do 6 to 8 reps.
• From standing, take a few approach steps, keeping your body as low as possible, then leap off your left leg. Land on right leg and immediately push off again as quickly as possible (it should look like an exaggerated running form). That’s 1 rep. Do 6 to 8 reps.